I discovered MacLean in the 1970s  but her career began in the 1940s. During the 1950s she was one of the more prominent women writing science fiction, with stories like “Pictures Don’t Lie,” “The Snowball Effect,” and “Incommunicado.” Like most authors at the time, she focused on short works rather than novels, but in the 1970s she did produce a small number of novels, of which this would be the best remembered. While I am unaware of any recent works by this author, she is still with us and could at any moment publish again. 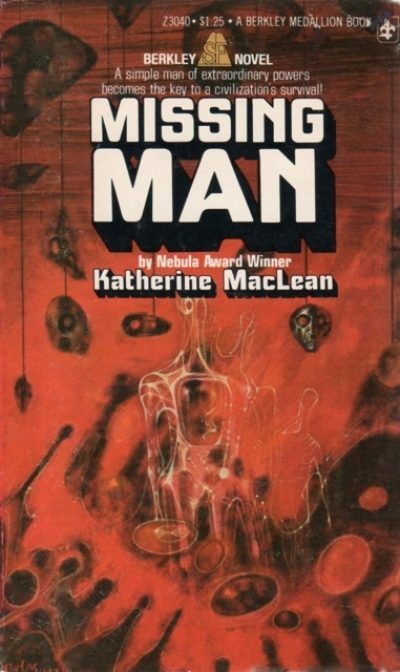 1975’s Missing Man is the novel-length expansion of MacLean’s 1971 Nebula-award winning novella of the same title. It’s been on my re-read list ever since I didn’t get around to reviewing it in the Millennial Reviews series. Upon re-reading, I discovered that I have been adding a superfluous “the” to the title for forty years. The second thing I discovered is that I had forgotten pretty much every detail of the novel except that it was set in New York around the year 2000 (actually, 1999). George Sanford is determined to keep living in New York. Unfortunately, he’s functionally illiterate when it comes to filling out forms and that renders him effectively unemployable. When we meet him, he is in the process of slowly starving to death amidst plenty. If he admits to his penniless circumstances, the city will force an adult support pension on him. The pension comes bundled with immediate exile from New York plus mandatory sterilization, and George isn’t keen on either. New York in 1999 is in some ways more tolerant than it had been a generation previous. One of the manifestations of its tolerance is that vast sections of the city have been turned into autonomous polities. People are tolerant of strange ways because they are never exposed to them, thanks to living in enclaves and communes of like-minded people. The city retains just enough control to keep everything running; almost everyone in the city is fed and housed. What the authorities would prefer that people not know is that the city is a delicate mechanism; one man who knew what he was doing could cause untold damage. That one man is Carl Hodges, whose intimate knowledge of the city’s infrastructure allows him to see its vulnerable points. While Carl is in no way malicious, grief over the recent death of his girlfriend leaves him vulnerable to the brilliant but damaged Larry Rubashov. With a drug-sodden Carl in his pocket, Larry can offer all of the communes both the weapons they need to fight their ideological enemies and protection from those weapons—for a price. And if Larry has to prove he can deliver what he promises by instigating the destruction of a couple of particularly vulnerable communities, Larry is perfectly OK with that. Something that I would have missed had I read this in 2000 (as I originally intended) is the eerie parallelism between the two terrorist outrages in this novel and 9/11; both involve re-purposing existing infrastructure with malign intent. Although more people are killed in the novel, the authorities take the attacks with greater equanimity than people did in the real world, perhaps because in the novel the attacks are committed by what amounts to a single mad bomber. Even though the original novella (and the related stories) were bought by John W. Campbell, Jr. for Analog, and even though George fits a profile for a certain kind of Campbellian character, large swaths of this book read like pointed critiques of Campbell’s hobbyhorses; I hope that that is intentional and not merely an optimistic misreading on my part. MacLean takes aim at ideas that range from removing the unfit from the gene-pool to the desirability of a psychic elite running the world (an idea that is raised, critiqued, mocked, and then discarded in the space of about five pages). and she is not kind to Campbellian enthusiasms. I once ear-flicked noted critic Ted Gioia over his review of Stand on Zanzibar. I argued that he had misinterpreted what was acceptable practice in the 1960s—sterilizing the weak and downtrodden on various facile grounds—as bold futurism. Missing Man takes that to extremes. Having first arranged the economy to eliminate all but a narrow range of jobs, the people in power then pressure the unemployable to trade survival for reproduction. Top-down mandatory sterilization is not an uncommon thing in SF of this era. Nourse’s The Blade Runner has something similar, although there the justification is medical in nature and not economic but as with the Brunner eugenics isn’t a futurist element but an expansion of what was considered acceptable at the time. The question MacLean raises is “who gets to decide what’s desirable and what’s not?” The eugenics program would eliminate the bulk of the population , while favouring a narrow range of traits that may well be useless in two generations time (monoculture is risky). When readers are introduced to one of the architects of the new economy, one of the drivers of the mass sterilization program, we find a man who seems to have been motivated by misanthropy and spite. If eugenics program wasn’t enough, there are a lot of pointed suggestions that the people calling the shots in this system aren’t very good at their jobs. The checks and balances aimed at keeping sadists out of key positions are very clearly not working, while those who might be good at their jobs are passed over. Ahmed has to struggle to get George employed by the Rescue Squad, even though George’s talents are an obvious asset to the Squad. In addition, the world of this novel has embraced some badly thought out paradigms; chief among them is embracing bold action on the basis of a mere statistical correlation. These are not people whose policies will end well. I have to wonder how this was pitched to Campbell. What did he see when he looked at the works that became this novel? Did he think it was an indictment of namby-pamby liberalism, what with the pervasive welfare and the way various chunks of the city were handed over to various ethnic minorities? What this novel suggests to me is I have to track down and review MacLean’s collection The Diploids or perhaps the later The Trouble With You Earth People, which overlaps with the first collection and is longer to boot. Missing Man is available from Wildside Press. 2: Because even though the Arab refugee community in Missing Man’s NYC is a collection of abrasive and potentially violent PTSD cases, it’s still better to be taken for one them than for a mixed-race Romany. 3: Which may actually be the main goal. The novel has a brief scene featuring a State of the Union address; the address declares that one of the US’s explicit economic goals is to reduce gross national product while moving the economy to a more sustainable model. What better what of getting rid of a consumer society than getting rid of the consumers?